An aspiring pilot and former Nelson and Colne College student is flying high after completing six months of intensive training in New Zealand. 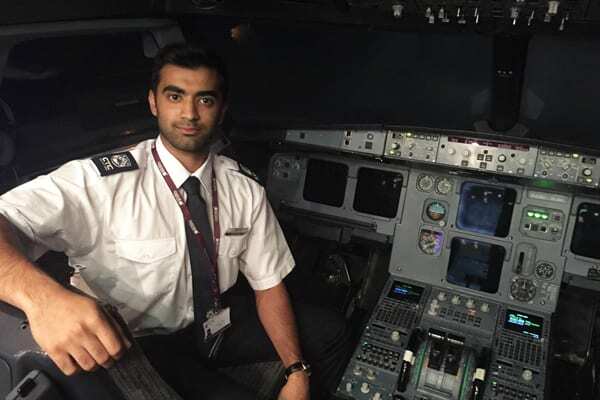 For Hassan Imtiaz, it has been a childhood dream to become an airline Captain, so when he secured a place on a competitive Cadet scheme with Qatar Airways one year ago, he couldn’t believe his luck. The 21-year-old now has just six months of his training left to go before he becomes a fully qualified Second Officer, and has shared his experiences of the last half year soaring the skies more than 11,680 miles from the UK. The former Marsden Heights Community College student, from Nelson, who studied Business, Economics and Maths at NCC, said: “The last six months have been amazing, and I feel very lucky to have had this opportunity. Hassan got his initial flying licence while studying at NCC, and after finishing from College he earned a place as a Cadet with Qatar Airways. In the first six months, he gained the theoretical strand of his Airline Transport Pilot Licence – where he had to undergo 14 exams at ground school in Southampton – and in New Zealand he has managed to complete competency assurance tests, learning to fly airlines in good bad weather. In the next six to 12 months, he will undergo his final training, and do line training – 12 take-off and landings on the Airbus A320 – in Doha, Qatar, to fully qualify. Hassan is also keen to stress to current College students that even if you make the wrong choices for your future initially, NCC can help get you on the right track for your future. Although he always knew he wanted to be a pilot, Hassan found himself studying the wrong subjects at a local sixth form, and decided he needed to start again if he was going to achieve his aspirations. He has never looked back, and is now excited about continuing on his exciting, demanding and ambitious career journey.